The Nigerian government of shame and her political slaves in Biafra land such as Chief Chekwas Okorie, Mr Peter Obi, Mr Rochas Okorocha, Mr Willie Obiano and many others are desperately looking left, right and center for organizations and persons of influence to capture and convert to enemies of Biafra. Emeka Umeagbalasi Esq. and his INTERSOCIETY Organization are the newest big catch by these political predators in Biafraland. 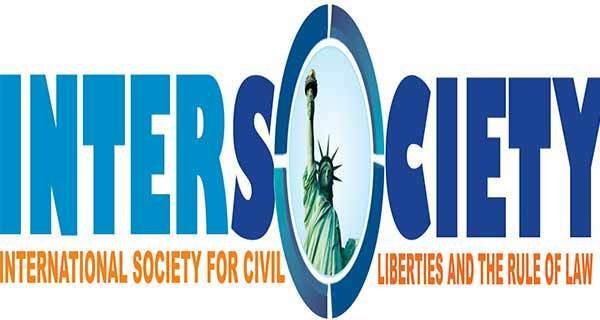 INTERSOCIETY in a publication released on June 2, 2017 committed blunders as it has shown the world in general and Biafrans in particular that it has become a mere 'brown envelop' and 'Ghana Must Go bag' cheap Human Right Organization after many years of incorruptible and unbendable disposition in their stand against injustice meted on the downtrodden in Biafra land and beyond. Oh! How have the Mighty fallen! It is shameful that a respected Human Right Organization such as INTERSOCIETY has been purchased for a dirty deal by the Nigerian government and their political slaves in Biafraland to fabricate lies against Mazi Nnamdi Kanu, a man who is always whiter than white and whiter than snow. In the seditious publication against Mazi Nnamdi Kanu which no doubt was hugely sponsored by the Nigerian government of shame as a desperate move to dissuade Biafrans from standing behind Mazi Nnamdi Kanu and IPOB towards the restoration of Biafra, INTERSOCIETY the newest fallen angels asserted maliciously without any evidence or proof, that Mazi Nnamdi Kanu collected SUV Jeep and huge cash from the blood-sucking politician like Mr Willie Obiano. What an affront from INTERSOCIETY! IPOB worldwide hereby condemn this gross falsehood by INTERSOCIETY of shame because it is one of those lies always peddled against Mazi Nnamdi Kanu and IPOB by the Nigerian government in their fight against Biafra restoration. Biafrans, Nigerians of good conscience and the world at large should ignore INTERSOCIETY and view their publication as the handiwork of 'Ghana Must Go bag' or 'Brown envelop' from Aso Rock. It is good to know that no amount of media blackmails can stop the burning desire of Biafrans of this generation from the restoration of Biafra, not even the one from INTERSOCIETY under reference. As for INTERSOCIETY and its leader Emeka Umeagbalasi Esq, if they fail to bring up proofs that Mazi Nnamdi Kanu collected anything as gift from any politician ever not even only Willie Obiano, INTERSOCIETY will get decimated by IPOB so as to serve as deterrent to any other organization no matter how highly placed they may seem . INTERSOCIETY must provide evidence to back their publication which is a deliberate character assasination against Nnamdi Kanu for money making. The battle line is drawn between IPOB and INTERSOCIETY and they should be ready to taste the venom of IPOB media warriors because any attack against Nnamdi Kanu is an attack against Biafra restoration and Biafrans all over the world. INTERSOCIETY has been enjoying the respect of IPOB reason why our media outlets publish virtually all their publications but since they have allowed themselves to be used by the blood-sucking politicians in Biafraland who are only doing the bidding of their Hausa/Fulani slave master in keeping Nigeria One by being used to stage media blackmail and media war against Nnamdi Kanu, INTERSOCIETY should be ready for us. All what Biafrans want from Emeka Umeagbalasi is a tangible evidence where Nnamdi Kanu collected the gift from Willy Obiano . As for the Mr Willie Obiano who could be the Chief financier and sponsor of this cheap blackmail against Mazi Nnamdi Kanu, he is going to see a political turmoil and constitutional crisis which will erupt in Anambra State when Biafrans will vehemently refuse to participate in Anambra governorship election come November this year. The success of luring INTERSOCIETY into this dirty deal by Igbo political predators is a fulfillment of Mazi Nnamdi Kanu’s prophetic declaration years ago that nothing domiciled in Nigeria no matter how good today can overcome the temptation of 'Ghana Must Go bag' from Aso Rock if tested, and that was his reason of situating the operational Head Quarters of IPOB in London. If INTERSOCIETY, a respected Human Right Organization of their caliber could not reject financial inducement to execute such a dirty deal of character assassination on Nnamdi Kanu who has become an institution to Biafrans, which other organization can reject the bribe from Aso Rock, the seat of evil doers? INTERSOCIETY has till 72 hours to come up with evidence to support their claims against Nnamdi Kanu or risk being decimated by IPOB media warriors. A word is enough for the wise! (King James Bible) Because sentence against an evil work is not executed speedily, therefore the heart of the sons of men is fully set in them to do evil. (King James Bible) Though hand join in hand, the wicked shall not be unpunished: but the seed of the righteous shall be delivered''. (King James Bible) For what is a man profited, if he shall gain the whole world, and lose his own soul? or what shall a man give in exchange for his soul?